On this site, you’ll find listings for several books written about personality traits, talents and how to more effectively manage personnel to the advantage of the organization. 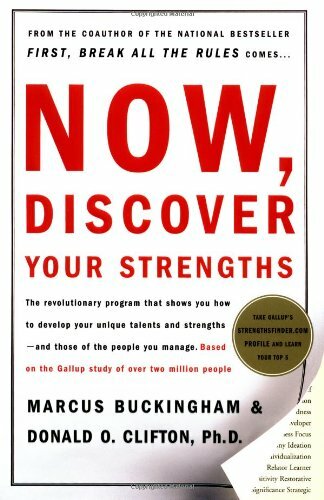 However, Marcus Buckingham, coauthor of the book First, Break All the Rules, and Donald O. Clifton, Chair of the Gallup International Research & Education Center, now provide managers with a positive approach to help identify and utilize strengths of individuals to the benefit of the organization in their best-selling Now, Discover Your Strengths. The book maintains that this unique, beneficial approach of focusing on strengths is far more effective in achieving success than eliminating weaknesses, given that we all have inherent strengths and natural weaknesses no matter what positions we might have. For example, the book points out; it does not matter if you are Bill Gates or Tiger Woods. True, these are individuals with tremendous talents who have made them well-known in their respective fields, but they also have weaknesses that play into the mix. It would seem our brains are programmed by nature from early childhood, no matter how good our nurture, to start being selective in a few key areas. It is as nature intended it to be. Without being selective, and allowing many of the billions of connections we are born with to lapse into disrepair, we would become dysfunctional with information overload. Therefore, it is understandable that with sufficient practice, while we might be able to learn different tasks well, we will never be great in these areas, unless we have a natural innate talent for them. Unfortunately, most of us do not have a good sense of our talents, let alone the ability to effectively use our strengths to our advantage. Rather, most of us spend our lives becoming all too aware of our weaknesses and spend our time trying to deal with our flaws, while neglecting our innate talents. However, to address this problem, Now, Discover Your Strengths provides access to a web-based interactive questionnaire, developed by the Gallup Organization, that quickly identifies your top 5 (out of a total of 34) positive “personality themes,” such as: Achiever, Deliberative, Harmony, Empathy and so forth that you might naturally possess. The book goes on to elaborate how each of the 34 unique themes can be identified, complete with individual profiles describing how each might act and what each might “sound like.” As each sees the world through their own strengths filter, it is easy to have friction between different individuals within the same department or organization, because we all see the world, and how it should look, so differently. While one may hear what someone else is saying, they may not be able to assimilate it into their personal world effectively. This is why partners or advisors are often so effective, as they add balance to the limits of others. One word of caution, however: do not buy this book used if you intend to take the preference test. There is a unique, one-time code that comes with each copy of Now, Discover Your Strengths, which is absolutely necessary in order to access the website’s resources. The book has limited value without the ability to take the online test. However, the test alone is well worth the price of the entire book just by itself. With this resource, you will better understand how to build a “strengths-based organization” by capitalizing on the fact that such traits are already present among those within it. With an estimated 8 out of 10 people in the US are not really in a position to capitalize on their strengths and talents, chances are most of us could benefit from reading this book. As most of us fail to capitalize on our strengths, it is not surprising that most departments in any company, no matter the size of the organization, are not operating at even par performance. The risk doing nothing is costly; not only in lost productivity, but in job satisfaction, employee retention and absenteeism and so on. This groundbreaking, resourceful book is easy to read in short concise chapters. Along with the associated preference test, Now, Discover Your Strengths, is a positive cost effective solution in resolving problems, and helping each employee achieve his or her full potential. This is must-read for managers and office teams who want a win-win solution in improving their own departments, as well as the lives of those who work for them.